For many years, Laura Byrne has volunteered as a healing harpist with hospice and cancer patients. 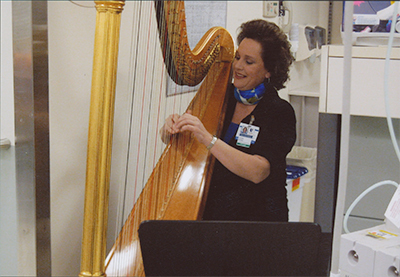 Since moving to Raleigh, she has played at UNC and Duke Hospitals and continues to support patients who are receiving treatment by creating solace and joy through her harp music. Laura also supports the “Make-A-Wish Foundation” of Eastern North Carolina and children who are fighting life threatening illness. Laura granted a wish for a blind teenager with cancer who wanted to learn to play the harp. Laura helped her pick out a special harp and taught her to play. Later, this wish child played for the “Make-A-Wish” Ball as a “thank-you” for all who helped her fulfill her wish.